16.85m x 5.2m Image powered by twin Yanmar diesels. Superb ocean-going vessel with proven sea keeping abilities. Recent delivery to Fremantle from Geraldton, WA into a 20 knot southerly trade wind still allowed cruise speed of 17.5 knots whilst consuming 100L/hr total ship. The setback wheelhouse enables a very comfortable ride whilst keeping the deck dry. This vessel has undergone a recent refit with new engines and generator installed. The transom has been modified in Geraldton by Fine Entry Marine and full documentation is available. New camo hull paint completed. 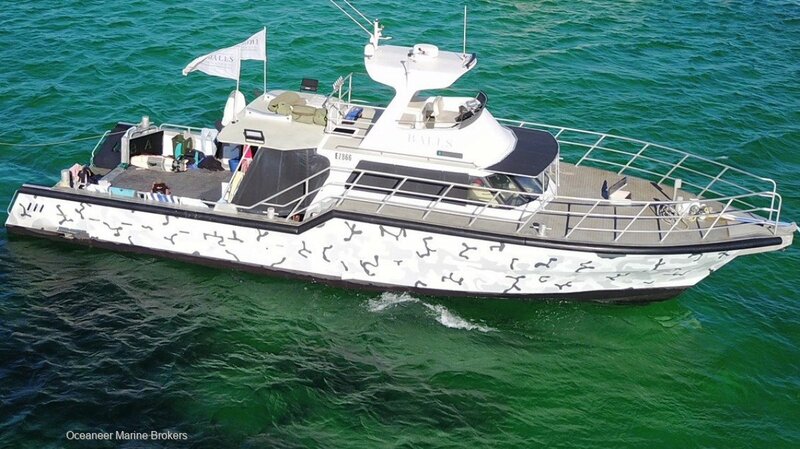 Tank capacities, 6000L fuel, 1400L water plus desal this vessel is well equipped for long range expedition boating. Good accommodation with 12 single berths, shower and toilet on deck. Vessel is being sold in current AMSA Survey and in operational order to Purchaser's satisfaction. Inspection will impress. Please contact Oceaneer Marine Brokers for more information on (08) 9243 6373 or sales@oceaneermarine. Com. Au.